Our facilities have been designed to meet the growing demand for improvement and response that our customers need in order to effectively meet the requirements of today’s competitive environment. Our molding processes are quality controlled from receipt of plastic resin through the final inspection of the chromatography supplies - whether it be a vial rack or aluminum crimps - before it is released to inventory. Advantage utilizes ANSI sampling protocols to ensure that the quality of our chromatography supplies are consistent and of the highest levels. In-house design expertise permits us to readily facilitate your request for new projects or modifications to existing products. 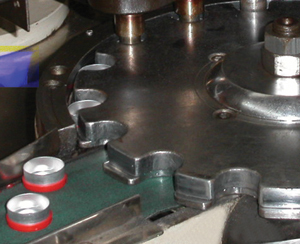 Advantage Molding Products also has machining capabilities to respond to any situation that may arise. Preventative maintenance is done on site and eliminates errors or downtime in regards to manufacturing lead times or scheduling. Hundreds of our consumable chromatography supplies are in use in laboratories every day, such as a vial rack or a screw cap. We offer quality products to provide you with uninterrupted productivity. Our closures and septa will provide you with the leading innovation in design and function. We offer our products in resealable plastic bags or custom jars. We also offer polystyrene and thermo form packaging for vial kits and samples.